Purpose: Humorously referred to as “the mother of all sit-ups”, the Teaser tests your powerhouse control to the fullest. At the peak of the exercise, momentarily hold the position, “teasing” the balance. Lie on back; legs extended out on a mat; arms overhead. Heels together; toes turned out slightly. Maintain the scoop; inhale; raise arms, head and shoulders, peeling upper body off the mat vertebra by vertebra; simultaneously lifting legs into a “V” sit. Hold the “V” position, balance on the tailbone. Exhale; roll spine down onto a mat. When head & heels touch the mat, stretch arms overhead to the starting position & repeat; inhaling as you float up; exhaling as you peel down. Visualization: As you roll down, imagine each vertebra touching the mat the way your fingers travel on the keys of a piano. Head stays in line with spine. Fingertips toward toes. Legs stretched long. Don’t allow the upper body to touch mat before lower body or vice versa. Take your time, relax your mind and find your rhythm as you go. Modification: Any difficulty sitting up all the way, slightly bend the knees, as you lift & lower body. Any back discomfort, perform Teaser with legs against a wall. Pilates… more than a late night infomercial. Pilates, a system of exercise created by Joseph Pilates, was originally designed to be a one-on-one personalized workout with an instructor. Nowadays, thanks to late night infomercials and books galore, Pilates seems to be thought of as just a generic “mat class”, but the true intention is to use any and all of the spring-loaded equipment created by Joe, including mat, to find and strengthen weakness in the body. Not every body needs every exercise. The work is most effective when tailored to you. It may help to understand where Joseph Pilates came from. Joseph Pilates was a sick child, suffering from asthma and rickets, and was determined to create a healthy body for himself. So, he studied yoga, wrestling, gymnastics and acrobatics, and throughout his life put together a series of exercises using a mat. He started teaching mat conditioning, and quickly noticed how nearly impossible it was for most people, so he knew they needed something else to support their mat work. At the same time, he was German national in an internment camp and many of the people around him were injured soldiers. For the injured soldiers he attached heavy springs to their hospital beds, so they could strengthen their bodies from bed. This design evolved into the “Cadillac” or “Trapeze Table” that current Pilates instructors use to strengthen legs, arms, chest, back and of course abdomen. The Universal Reformer, or another “bed on springs,” offers additional resistance in order to provide more stability or to provide an added challenge to those who need it. When Pilates is taught one-on-one (the ideal way), the instructor typically incorporates work on the reformer and mat, as well as other Pilates apparatus, based on your needs. The individual session caters to the specific needs of the client, where each exercise is systematically performed and specifically chosen for you. The focal points of his work are to increase lung capacity, to improve core strength and to use one’s mind to control body movements. Hence, the six Pilates principles evolved: control, centering, concentration, precision, breath, and flow. The work on the mat, where your muscles create the resistance, and the apparatus, where springs create the resistance, complement each other. As you become stronger by working on the apparatus, consequently, the mat work often becomes more challenging and fulfilling. Including private Pilates sessions in your fitness regime will better allow an instructor to focus on your individual needs, and will help you to develop the strength and flexibility necessary to correctly perform and benefit fully from the mat work. Your workout should never feel easy, but should always present new and different challenges as you work your powerhouse deeper. So, enjoy the “journey” that is Pilates. It’s well worth the hard work! Purpose: To work the powerhouse and strengthen the back of the legs (hamstrings). Lie on your back with your knees bent, hip width apart, both feet firmly planted on the mat; arms by your sides, palms down. Squeeze your bottom and raise your hips off the mat. The hips, knees and feet are in perfect alignment. Inhale, pull your navel to spine, and lift one leg out long in front of you. Then, extend it up to the ceiling, pointing toes. Exhale, flex your foot and lower your leg to your knee. (You may lower the leg further as long as the hips stay level and leg does not drop to the mat). Visualization: Imagine you are suspended from the ceiling by a sling around your hips, keeping you lifted. Purpose: The last of the Stomach Series, this works the external obliques, waistline and powerhouse. Lie on your back with hands behind your lifted head; elbows wide and your knees bent into your chest. Extend your right leg out long; hovering above the mat. Twist your upper body until the right elbow touches left knee. Open the back (left) elbow behind you. Inhale as you lift to twist and hold for 3 counts. Exhale and switch sides, bringing your left elbow to your right knee while extending the opposite (left) leg out in front of you. Hold for 3 counts. Keep your upper back and shoulders off the mat as you twist from side to side. Complete 8-10 times. To end bring both knees into chest. Checklist: Lift and twist from your waist, not from your neck and shoulders. The back elbow never touches the mat. Look at your back elbow as you twist. Anchor your center to the mat so you don’t roll from side to side. Lower your extended leg about 45 degrees or more… back should not arch off mat. Note: Avoid twisting exercises such as this if you have suffered a recent back injury. Visualization: Imagine you have an X on your stomach and you are crossing to each end of the X. A one-on-one session is a great way to start your Pilates training, but when you learn your routine, you can work out with a partner or small group to cut costs. Joseph Pilates was a man, and he created a system of exercise meant for every body, male or female. Pilates requires concentration, focus, coordination and agility. Pilates builds a foundation of core strength, and that requires some deep, precise, consistent work. Only after your core is established and muscles correctly firing can you move on to the more complicated, advanced Pilates exercises. So yes, Pilates can seem repetitive in the beginning. But be patient! Your repertoire will expand as you become stronger and are able to demonstrate control in your body. 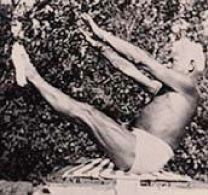 Joseph Pilates was not a dancer; he was a boxer and wrestler, studied yoga and gymnastics. When Joseph and his wife Clara set up shop in New York City, George Balanchine sent many dancers to Pilates to rehabilitate their ballet injuries. The news of a workout that promoted strength with stretch spread quickly through the dance community, and has been popular ever since. However, Pilates is beneficial for all populations. Pilates can be modified to accommodate nearly any injury, but true Pilates, once the basic concepts are understood, is challenging to the most fit person. Purpose: The fourth exercise in the Stomach Series targets the powerhouse to the extreme. Lie on your back with hands behind your lifted head; one on top of the other, (not interlaced). Elbows wide. Extend your legs straight to the ceiling, heels together and toes turned out slightly, squeeze inner thighs, sink navel toward spine. Inhale and lower your straight legs down toward the mat for 3 counts. Stop if you feel your lower back begin to arch. Exhale as you raise your straight legs toward the ceiling. Don’t allow the legs to pass 90 degrees; the tailbone does not leave the mat. Remain perfectly still in your torso. Engage the glutes and inner thighs to support and protect your back. If your back arches off the mat as you lower your legs, you are taking them too low. Bring shoulders away from ears. Note: If you have a delicate back, place your hands in a V position just below your tailbone (palms down) and leave your head down. Visualization: Imagine your legs are attached to springs above your head. You must stretch the springs on the way down and resist their pull on the way up. Amy B. is no stranger to Pilates, but was still amazed at how her Pilates sessions helped her through pregnancy, delivery, and being a busy, working mom of 2 lively kids. In San Francisco and Seattle, Amy took Pilates Mat classes for 7 years before the birth of her first child. After Amy’s baby was born, she felt strained in her back and shoulders due to lugging around a car seat with a growing baby. She wanted an efficient workout; something that combined strength and flexibility, because with a new baby she no longer had time to separately do strength conditioning and yoga — she needed to cram it all into an hour if possible. Lastly, she wanted her pre-pregnancy body back and to fit into her clothes again. She contacted Jocelyn and decided to start private sessions once a week. Fast-forward two years; Amy is expecting her second baby. Amy says, “I felt very strong this pregnancy, which I attribute to consistently running and doing Pilates for the two years prior. For the first several months, I kept with the same exercises, but as my belly started to grow there were obviously some exercises we had to cut out or adjust to not lay on my belly or put unnecessary strain on my back”. Amy was elated to learn that she could be tired during the day, but a Pilates session with Jocelyn after work would energize her and she’d feel great! She did Pilates right up until the end of her pregnancy, 10 days before she gave birth to Emilia. According to Amy, delivery was “easy”! It took 5 minutes for her daughter to join the world with no medical interventions. Recovery was much easier this time too. She was pushing a stroller around Green Lake a week later, and resumed Pilates sessions with Jocelyn about a month later. Purpose: As the second exercise in the Stomach Series, Double Leg Stretch continues to challenge your coordination, work the powerhouse and stretch your body. Lie on your back and hug both knees into your chest, hands reaching toward ankles, head and shoulders lifted off mat. Inhale and reach the arms overhead back by your ears and your legs straight out in front of you. Raise them off the mat at about a 45 degree angle. Back must not arch off floor. Exhale and circle the arms around as you bring your knees back into your chest. Remain still in your torso; head and shoulders lifted throughout the exercise. Repeat 8-10 sets. To finish, hug both knees in toward chest, put head and shoulders on mat. Visualization: imagine the center of your body thinning out like taffy. Support your neck by keeping your chin toward your chest as you stretch long. Squeeze your buttocks and upper inner thighs tightly as you extend your legs to support the lower back. As you inhale and stretch out, keep your arms straight. Your abs hold you down on the mat. Modification: For a sensitive low back, begin with the legs at a 90 degree angle and gradually advance to 45 degrees. Abbreviate the arm movement if you have a delicate shoulder. Progression: Move directly to Single Straight Leg Stretch – which will be previewed in next month. Purpose: Single Leg Stretch strengthens the abdominals and the buttocks as well as improves coordination. This is the first of five exercises termed as the Stomach Series. Sit in the center of your mat with your knees bent. Hug your right leg and pull it in to your chest with your inside hand on the knee and your outside hand on the ankle. Roll your back down to the mat, bringing the bent leg (right leg) with you; head and upper shoulders are off the mat. Then, extend your left leg out in front of you; let it hover above the mat at about a 45 degree angle or at an angle so your back stays flat on the mat. With elbows lifted; chin to chest; inhale. Then, exhale and switch legs, bringing the outside hand to the ankle and the inside hand to the knee (left leg). Stretch your right leg long; hovering above the mat at about a 45 degree angle; making sure your leg is in line with the center of your body. Scoop your belly at all times. Stay lifted (eyes on belly) and slide shoulders down away from ears. Remain still in your torso- not rocking your body from side to side when switching legs. Pay attention to the hand placement as it keeps your leg in proper alignment with your hip. Visualization: Imagine you are anchored to the floor below. Modification: Rest your head on the mat when necessary. If you have a bad knee; hold the underside of the thigh. For a bad back; extend the straight leg to the ceiling. As your lower abdominal strength improves, you can begin to lower the leg. Can Pilates really make you taller? According to SAC member Lenell Nussbaum the answer to this question is yes! Lenell began Pilates a couple of years ago. She experienced regular back pain due to scoliosis and decided to give Pilates a try. “The biggest change is that my back is no longer a pain issue. The by-product is that I am taller!” said Lenell. Pilates works in several magnitudes – twisting, bending and extending – to strengthen the “powerhouse”, the muscles that support your spine. More space between the vertebrae is created by working and articulating the space in these magnitudes, thus lengthening your spine, improving your posture and in essence making you taller. Pilates exercises are specifically designed to reach and engage the “core” or “powerhouse” muscles. Exercises such as spine stretch forward on the mat, short spine on the reformer and push the pedal down on the wunda chair strengthen the muscles surrounding the spine, therefore creating support for the spine allowing you to stand more erect. The extra space created by stretching the spine will actually lengthen the spine and reduce pain caused by poor posture or weak muscles. Lenell has grown 1.5 inches since starting Pilates and is now living pain free!